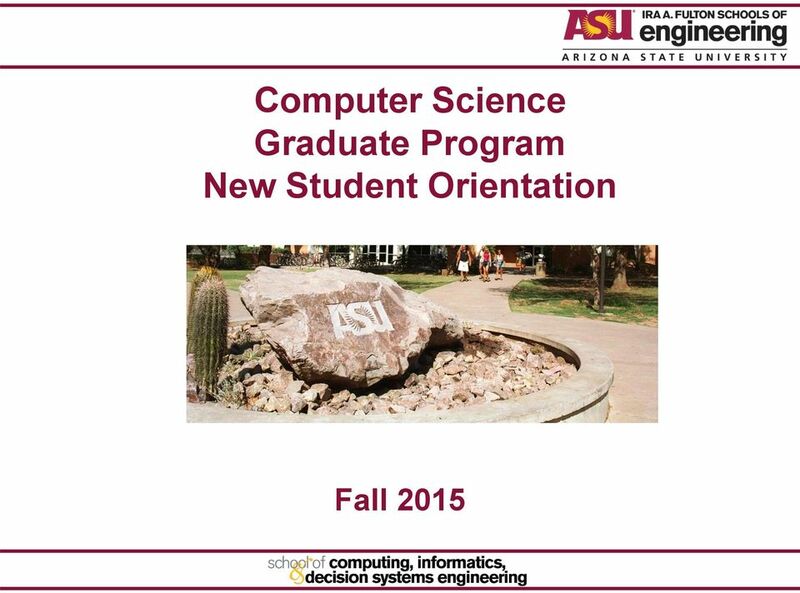 Download "Computer Science Graduate Program New Student Orientation. 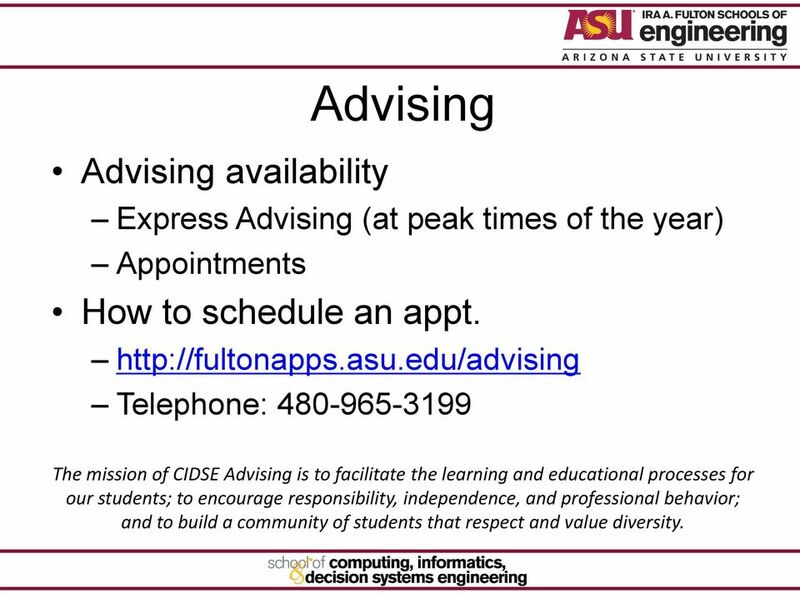 Fall 2015"
3 Advising availability Advising Express Advising (at peak times of the year) Appointments How to schedule an appt. Telephone: The mission of CIDSE Advising is to facilitate the learning and educational processes for our students; to encourage responsibility, independence, and professional behavior; and to build a community of students that respect and value diversity. 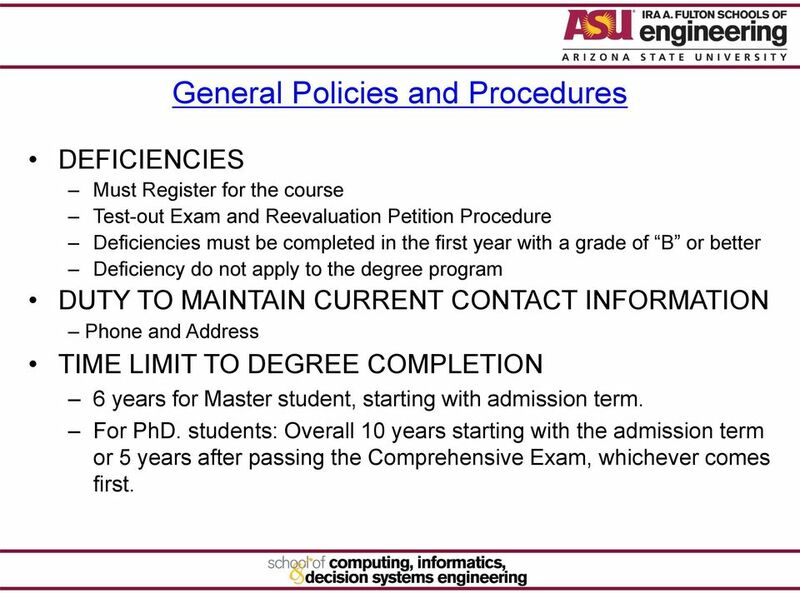 9 General Policies and Procedures DEFICIENCIES Must Register for the course Test-out Exam and Reevaluation Petition Procedure Deficiencies must be completed in the first year with a grade of B or better Deficiency do not apply to the degree program DUTY TO MAINTAIN CURRENT CONTACT INFORMATION Phone and Address TIME LIMIT TO DEGREE COMPLETION 6 years for Master student, starting with admission term. For PhD. students: Overall 10 years starting with the admission term or 5 years after passing the Comprehensive Exam, whichever comes first. 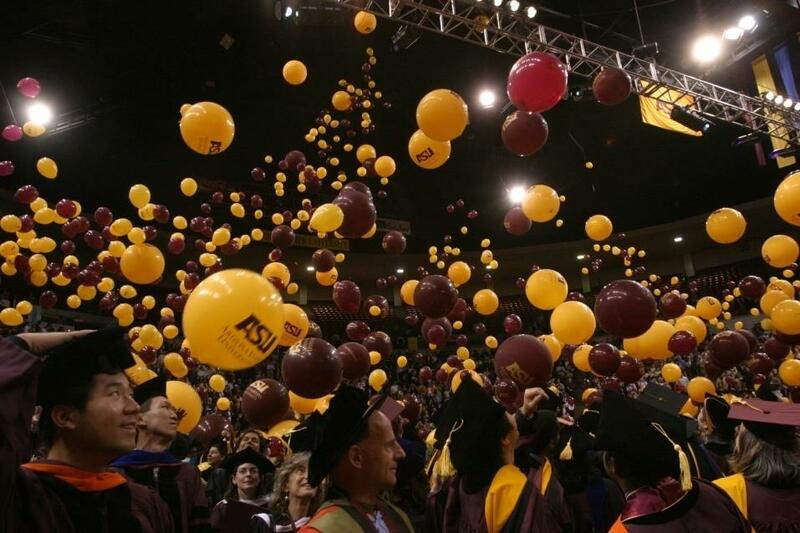 10 CONTINOUS ENROLLMENT Students must be registered for a minimum of one graduate credit hour during all phases of their graduate education, including the term in which they graduate. 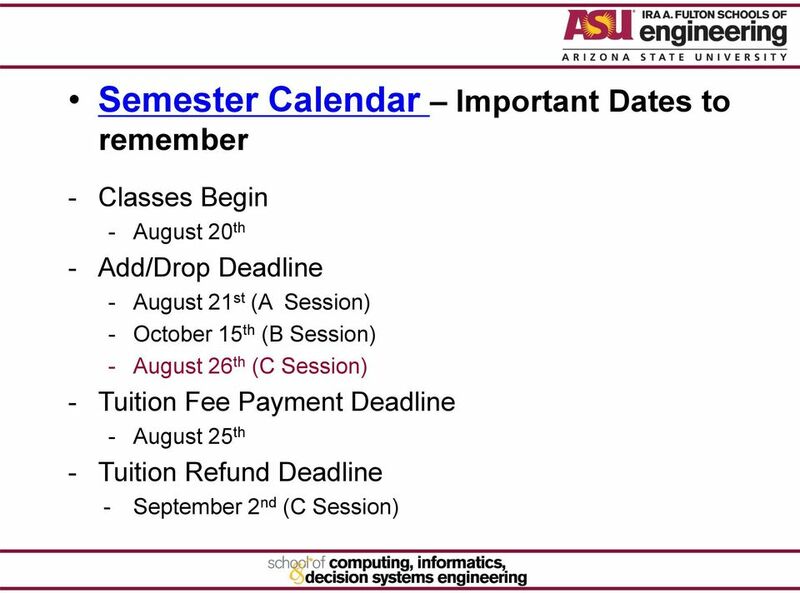 Registration for every fall semester and spring semester is required. 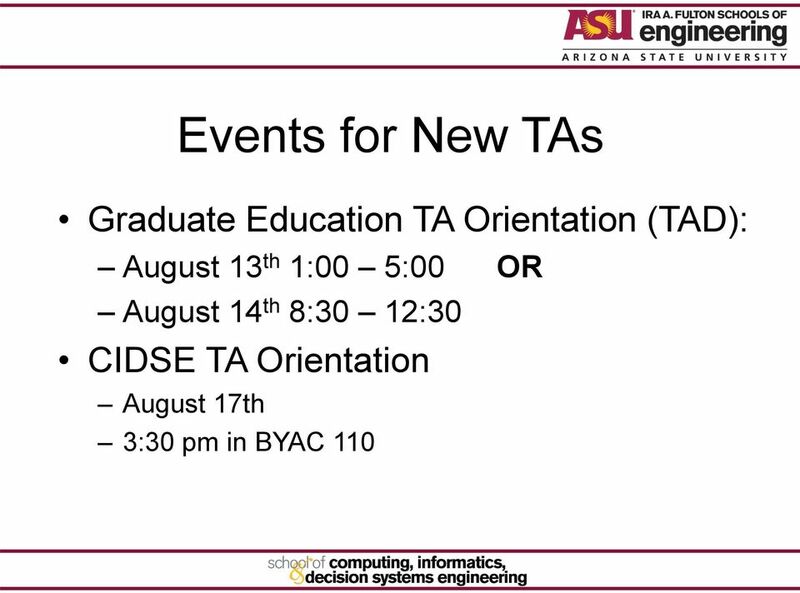 Summer registration is required for students taking examinations, completing culminating experiences, conducting a doctoral prospectus, defending theses or dissertations, or graduating from the degree program. 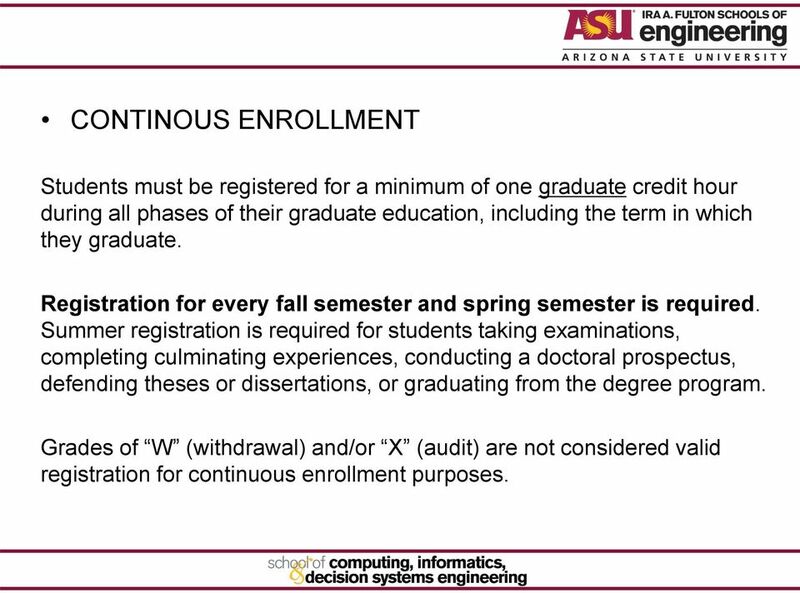 Grades of W (withdrawal) and/or X (audit) are not considered valid registration for continuous enrollment purposes. 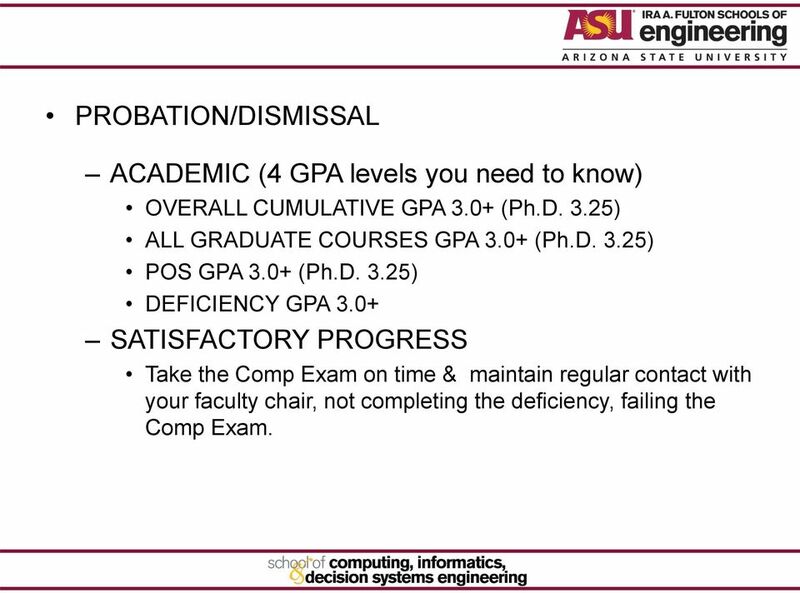 11 PROBATION/DISMISSAL ACADEMIC (4 GPA levels you need to know) OVERALL CUMULATIVE GPA 3.0+ (Ph.D. 3.25) ALL GRADUATE COURSES GPA 3.0+ (Ph.D. 3.25) POS GPA 3.0+ (Ph.D. 3.25) DEFICIENCY GPA 3.0+ SATISFACTORY PROGRESS Take the Comp Exam on time & maintain regular contact with your faculty chair, not completing the deficiency, failing the Comp Exam. 13 REPEATING OR WITHDRAWING FROM COURSES All graduate courses with a grade of C or better are acceptable on the Program of Study (ipos). 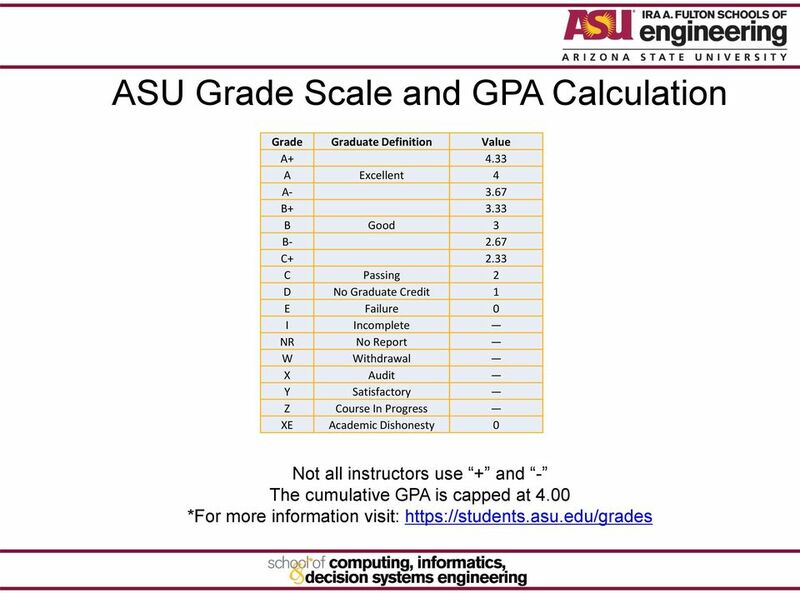 All grades are calculated into the cumulative GPA. A deficiency course with a grade below B must be repeated. International students should be aware of the consequences of not maintaining full-time status: 9 credit hrs. or 6 credit hrs. as an RA/TA. 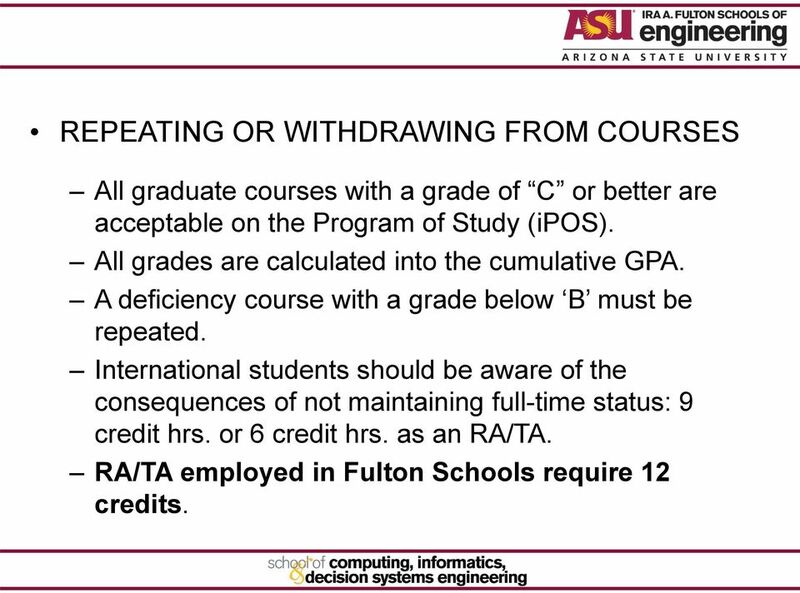 RA/TA employed in Fulton Schools require 12 credits. 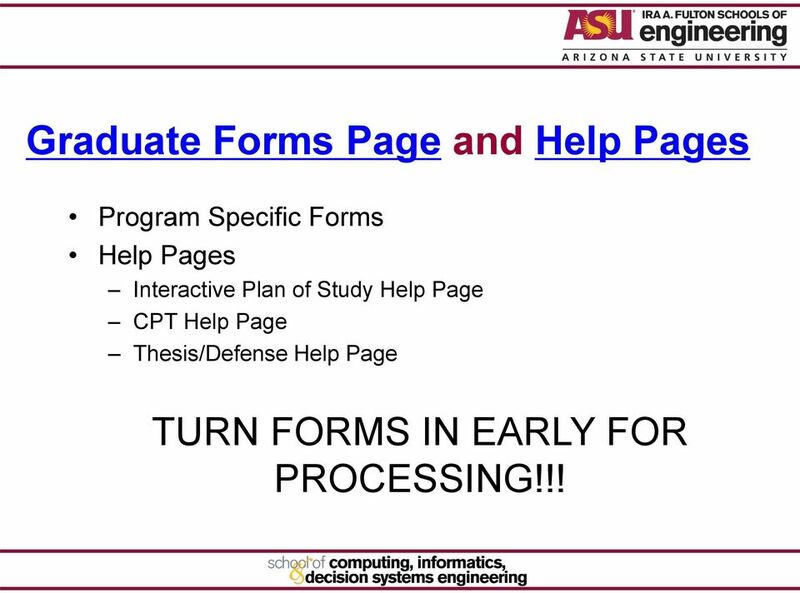 16 Graduate Forms Page and Help Pages Program Specific Forms Help Pages Interactive Plan of Study Help Page CPT Help Page Thesis/Defense Help Page TURN FORMS IN EARLY FOR PROCESSING!!! 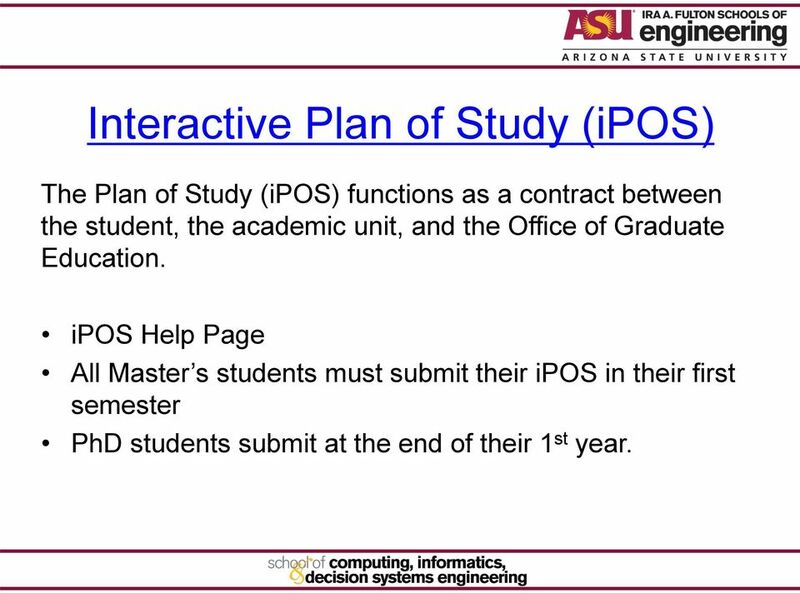 17 Interactive Plan of Study (ipos) The Plan of Study (ipos) functions as a contract between the student, the academic unit, and the Office of Graduate Education. ipos Help Page All Master s students must submit their ipos in their first semester PhD students submit at the end of their 1 st year. 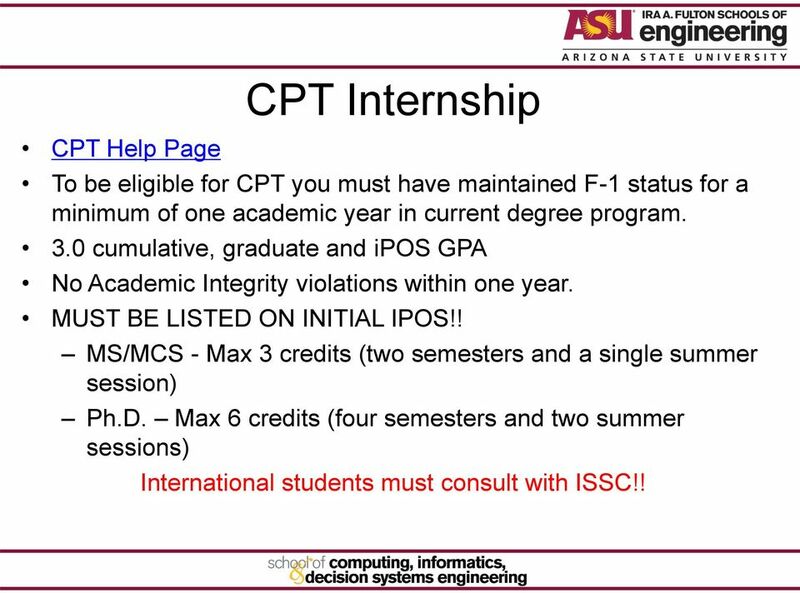 18 CPT Help Page CPT Internship To be eligible for CPT you must have maintained F-1 status for a minimum of one academic year in current degree program. 3.0 cumulative, graduate and ipos GPA No Academic Integrity violations within one year. MUST BE LISTED ON INITIAL IPOS!! 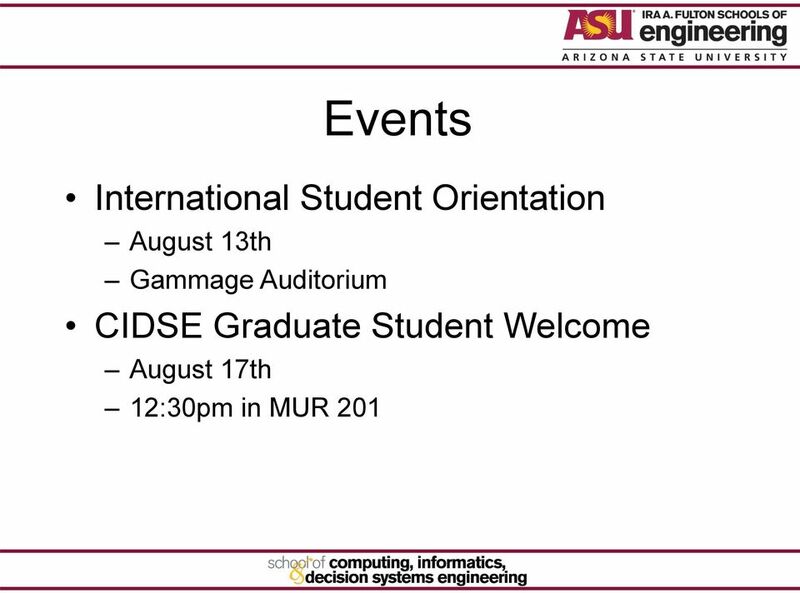 MS/MCS - Max 3 credits (two semesters and a single summer session) Ph.D. Max 6 credits (four semesters and two summer sessions) International students must consult with ISSC!! 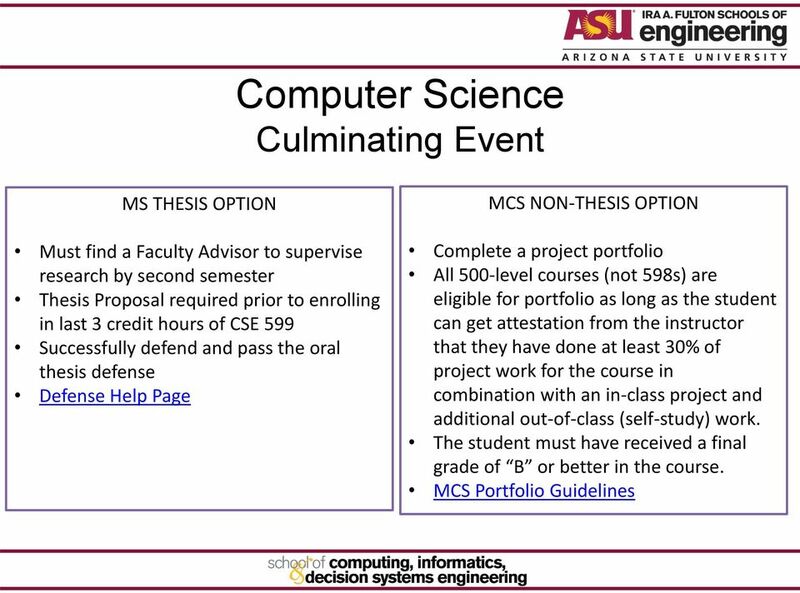 27 This concludes the MS portion of the presentation. Questions? 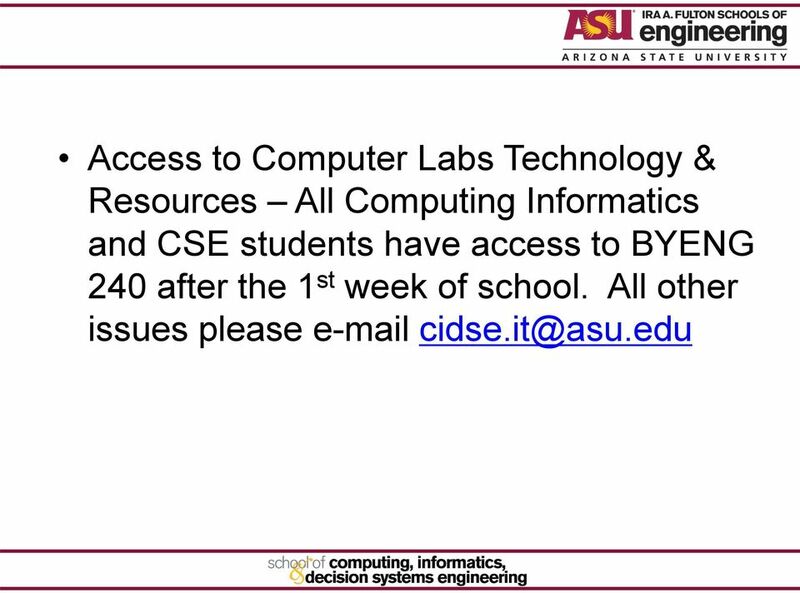 MS students may leave the room if you do not have any questions. 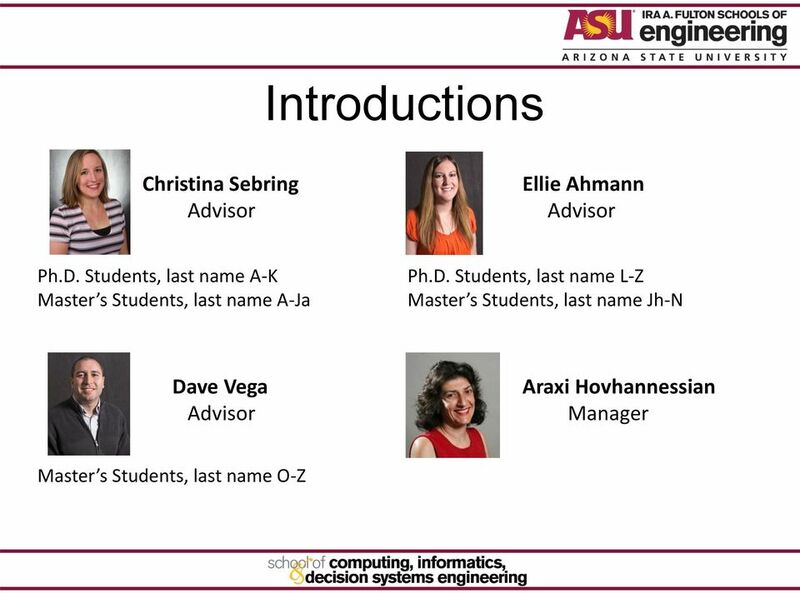 Ph.D. students, please stay for your portion of the presentation. 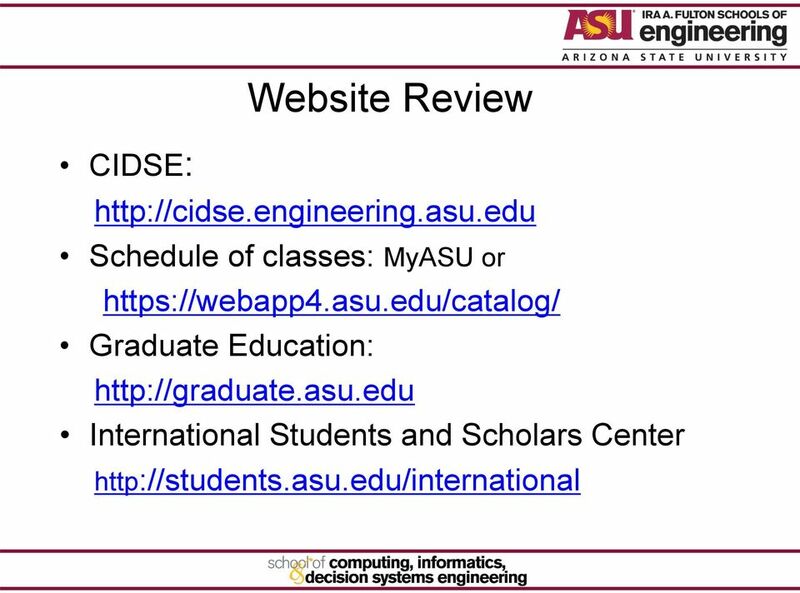 Graduate Program Assessment Plan Mission: The mission of the master of science program is to promote critical thinking and creative skills based on the theory, principles, and techniques of electrical. 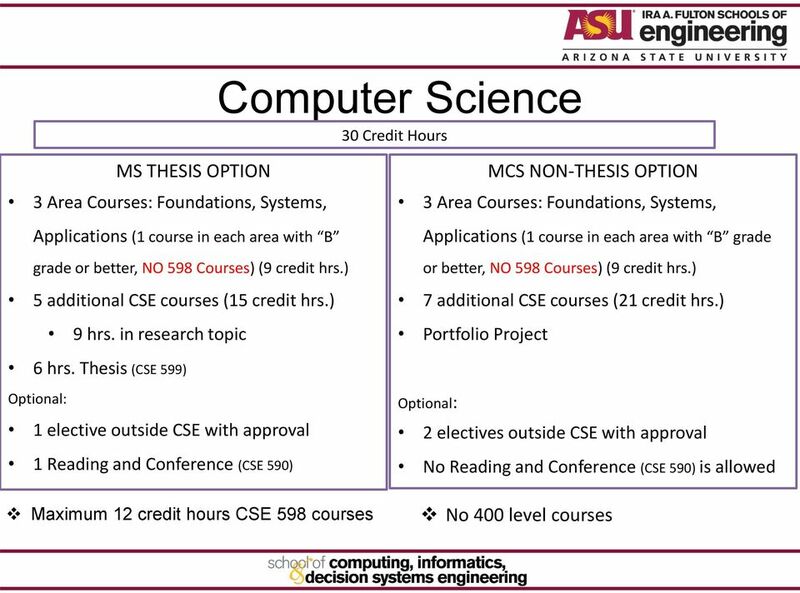 UTSA Computer Science MS Degree Program Weining Zhang Outline General information Admission conditions Transfer credits Program options Courses & Comprehensive exam Academic Status Financial Aids Ph. D.
ACADEMIC YEAR: 2015-2016 HANDBOOK FOR MASTER OF ARTS DEGREE IN POLITICAL SCIENCE EASTERN ILLINOIS UNIVERSITY DEPARTMENT OF POLITICAL SCIENCE REQUIREMENTS FOR THE M.A. DEGREE I. Graduation Requirements. Department of Political Science Kent State University Graduate Studies Handbook (MA, MPA, PhD programs) 2013-14 Table of Contents I. INTRODUCTION 6 II. 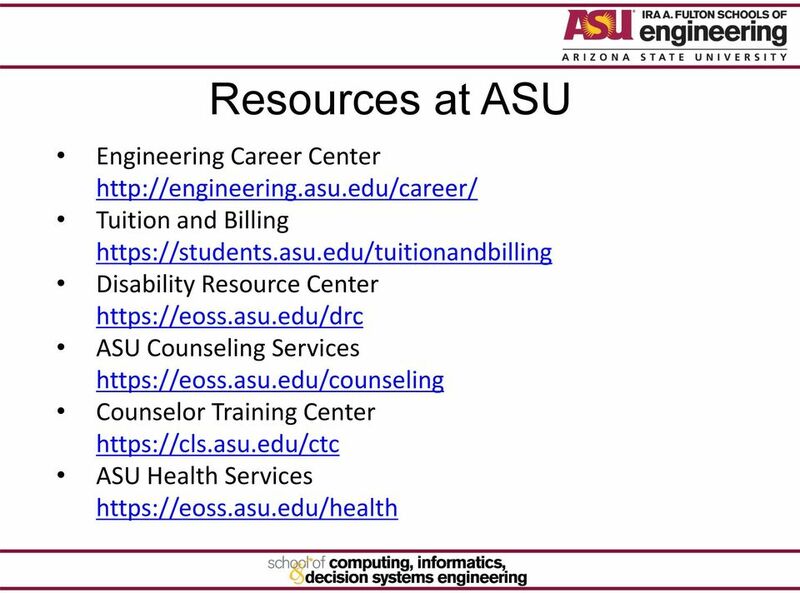 THE MA AND PHD PROGRAMS 6 A. ADMINISTRATION 6 B. GRADUATE STUDY IN POLITICAL SCIENCE (Formally adopted May 6 th, 2009.) 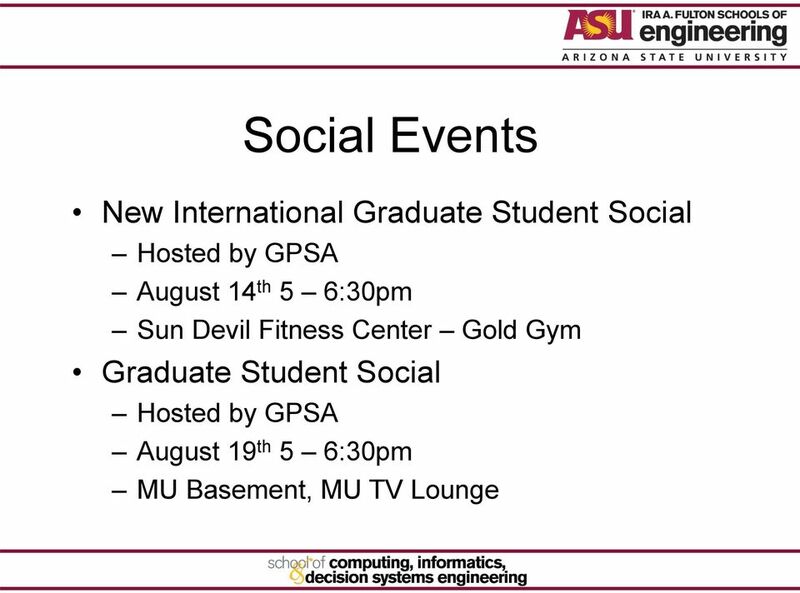 The following requirements apply to those students entering the graduate program in political science in August, 2009, and thereafter.